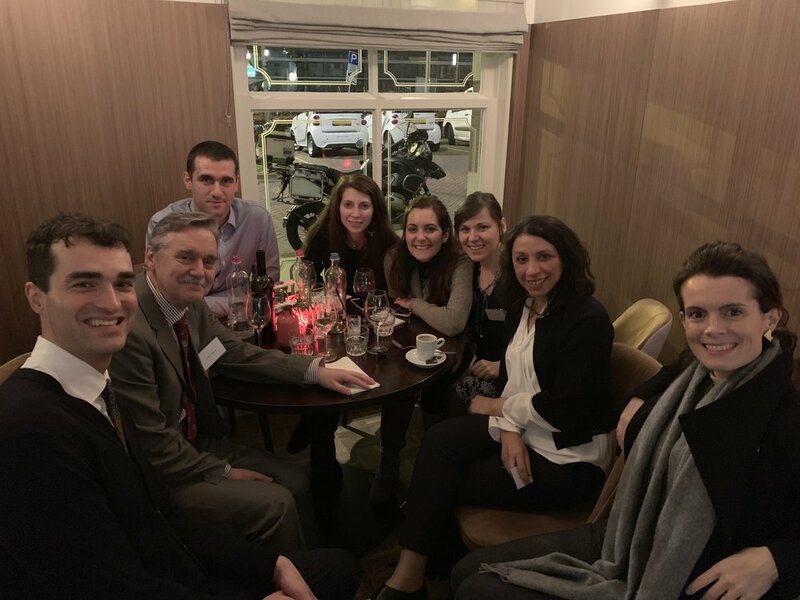 The Dutch Neuro-Ophthalmological Society (NeNOS) & UKNOSIG were delighted to welcome attendees from the Netherlands, UK & all over Europe to this oversubscribed joint conference (programme here) at the Eye Filmmuseum Amsterdam March 1st & 2nd 2019. Attendees were welcomed on the first day by Dr Jan Willem Pott (University of Groningen) reminiscing about his first visit to Amsterdam as a child and promised the general ophthalmologists that Neuro-ophthalmologists were not nearly so intimidating as the Dutch military police (!) and the UK attendees that they would always find welcome and friendship from colleagues here in the Netherlands. Alongside the academic programme throughout Day 1 Dr Axel Petzold (Moorfields, Queen Square & UMC Amsterdam) ran parallel sessions on OCT imaging & analysis, as well as accessible ophthalmoscopy using the Arclight solar-powered pocket ophthalmoscope. Dr Plant described lesional syndromes from V1 to V5 via 150 years of research in this area; Maria Maia de Silva (UCL Institute of Neurology) highlighted static field homonymous hemianopia in Posterior Cortical Atrophy; Michael Crossland (Moorfields) described his progress towards a Pulfrich-ometer; Prejaas Tewarie (University of Notthingham) computationally modelled structural and functional brain networks, in recovery from optic neuritis; and Steven Scholte (UMC Amsterdam) described his attempts to understand and model visual pathways using machine learning. Judith van Everdingen (Rotterdam Eye Hospital) outlined LHON and current (Idebanone is licensed and funded in the Netherlands) & developing (Rhodos, Reverse, Reflect & Rescue RCTs - nil positive outcomes to date) treatments; Mies van Genderen (UMC Utrecht) took us on a whistlestop tour through a range of inherited optic neuropathies raising the key clinical point that in mitochondrial optic neuropathy atrophy STARTS in the GCL so you will see atrophy there at onset; Emanuel de Carvalho described three types of inherited retinal dystrophies with pathognomonic electrographic findings (clue: they are Enhanced S-cone syndrome, KCNV2 retinopathy & Bradyopsia RGS9 & R9AP retinopathy); Ailbhe Burke (Moorfields) highlighted the evidently UK-specific problem of an excess of pseudopapilloedema referrals and a discussion ensued around clinical approaches to this (hint: nothing replaces clinician review); Jan Willem Pott described the frequent co-occurrence and pathophysiology of alcohol & B12 deficiency optic neuropathy (hint: normal B12 levels don’t rule this out, need methylmalonic acid and homocysteine). Emanual de Carvalho returned to talk us through OCTA in ischaemic and genetic optic neuropathies; Willemien de Vries-Knoppert (UMC Amsterdam) talked through the controversies in what has been described as Paracentral Acute Middle Maculopathy and described two distinct phenotypes; Dr Plant returned to tell us never more to use the term ‘amaurosis fugax’ and rather to call it transient monocular visual loss (TMVL) and outlined both embolic and vasospastic presentations; Rene van Rijn (VUMC Amsterdam) outlined operative options for persistent stable diplopias; finally Carlijn Borm described the protean visual impairments associated with Parkinson’s Disease, from dry eyes, to retinal changes reducing colour and contrast sensitivity, to visual processing disorders and hallucinations. Spoiled with rather more courses than advertised and free-flowing wine, discussions continued into the evening at the conference dinner. UK attendees were rather outdone by our European colleagues in the number of languages spoken well, but attempted to make up for it with stories told well. Dr Petzold opened day 2 on the Glymphatic system followed by Lisanne Balk (VUMC) taking us through the fascinating oddities that are PHOMS and Danko Coric (Moorfields) took us through the assessment and usefulness of vitreous haze. Dr. Sui Wong (Moorfields, St Thomas’) described progress on the new ocular myasthenia rating scale, the OMGRATS; Jenny Nij Bijvank (VUMC) discussed infrared video-oculography & INO in MS; Kawita Kanhai (Centre for Human Drug Research, Leiden) expounded on the role of Fampridine (previously licensed to aid walking in MS) for INO in MS; Dr Jonathan Virgo (Moorfields) presented preliminary results suggesting that, in his sample from Moorfields high dose oral steroids don’t improve outcomes across all types of optic neuritis; Andrew Blaikie rounded off the academic session with a demonstration of the possibilities of Arclight, a solar powered pocket ophthalmoscope, for bringing funduscopy to the masses even in resource-poor areas. Attendees were invited to engage with and discuss a series of case presentations, including a fascinating description of DADA2 mutation causing a Polyarteritis Nodosa-like presentation with related eye pathology, to round off a successful conference, and those who stayed until the finish were offered quite the musical reward, as one of our senior colleagues shared their prowess to bring the meeting to a close.